Walk past the queues with your skip the line ticket, to tour the Athens' New Acropolis Museum - the most important archeological museum in Athens. Your knowledgeable tour guide will show you the most interesting attractions from over 4,000 artifacts currently on exhibition. Highlights of the Acropolis Museum include statues from the Archaic period, and the impressive Parthenon hall which celebrates the famous temple on the peak of the Athens Acropolis. Other exciting exhibits include the archeological remains from the ancient city which were revealed by excavations on the site of the museum itself. 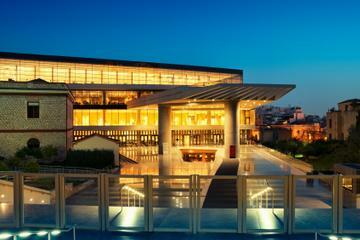 When your guided tour ends, continue exploring the Acropolis Museum at your leisure. As the museum is close to the site of the Acropolis, why not take yourself off to see this stunning UNESCO World Heritage site as it stands today, and reflect on the fascinating facts that you've learnt from your guided tour.